Happy Thursday!! I'm currently on my second day of a quick trip to Orlando with a friend so this is definitely not what I'll be wearing today. And I confess I do have the original heels from this look but I decided I liked it better with the dark brown Prada's instead. I'm also sporting my latest pair of sunglasses from Ditto's Endless Eyewear program! I sent my Miu Miu pair back after just a week but I'm keeping these a little longer before I trade them in. Use code CLOSETFASHIONENDLESSDITTO for your first month free! I hope you're having fun in Orlando - it's always nice to get in a quick getaway! I have to say, I would not want to send this pair back, they look so good on you! 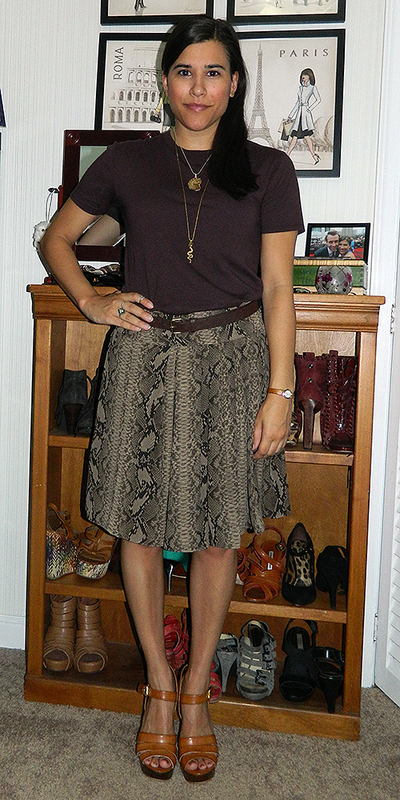 Love the edgy snake print skirt and the heel swap is on point. You are quite the jet setter! Enjoy Orlando, can't wait to see the pics. And love this look! Love this combo - and I prefer the sandals you're wearing today, the look is more polished. Enjoy Orlando .. and oh I really like the sunnies. You keeping them ? I really like the purple tee with the printed skirt so it's great you cold rewear it - the different heels really make it a dressier look! :) Love the sunnies too!